← When will we ever use this? 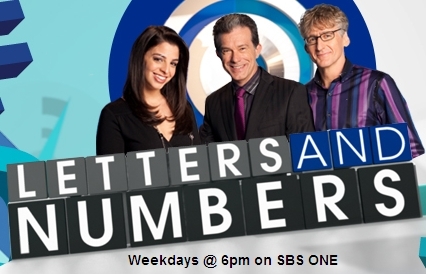 I happened to tune into SBS TV tonight to see: “Letters and Numbers Ep 28 : Air Date 8th Sep 6:00pm, Melbourne time. Letters and Numbers is hosted by Richard Morecroft. Unlike most game shows, it doesn’t drag out the questions, of which there are only two types. A very simple format if you wan’t some brain exercises at the end of each day! Of particular interest is the co-host Lily Serna (pictured above) who is currently completing an honours degree in Mathematics. I think her short biography would be well worth showing to students. Studying Mathematics can open many doors! In the numbers game, one contestant chooses a mix of six numbers and they both try to get as close to the randomly generated target number as they can in 30 seconds using basic principles of maths: addition, subtraction, multiplication and division. Each number can only be used once. Can you complete the game shown below? This entry was posted in Games, Problem Solving, Web Resources and tagged degree, gameshow, letters, Lily Serna, Maths Blogs, numbers, Richard Morecroft, sbs, tv. Bookmark the permalink. The link to the show tells me “Geoblocked. This video is not available in your region.” Bummer. I can get 4 above or 4 below on the puzzle you gave. I wonder if someone can find a closer total. Hi Sue, sorry that you can’t get a video feed. A correct solution is shown on the video. So lets make this challenge just for US maths teachers who can’t “cheat”. By the way, I am just starting to read “The Number Devil” which you recommended in your post last year: “A Dozen Delectable Maths Books”. Thanks for your comment, Jeff. Let me know how you like it, Jeff. Yes 449 is possible! Lily shows a correctly worked solution on the Video. The contestant gives: 25 x 2 x 10 – 8 x 7 + 2 = 446; which is only 3 away from the target. However, his answer is disqualified because he used the number 2 twice! So leaving +2 off the end gives 444 which is 5 away from the target. See if your students can get closer. I will post some more problems from the show in my next post. Do you have to use all the numbers? Do you know if Lily and David are allowed more times to come up with solutions and words than the contestants? Is the show edited? 25*9=225 225*2=450 (450-(8-7))=449 ! worked it out in seconds..